How have the G8 and G20 summits performed since the G20 leaders began meeting in 2008? What has been the division of labour during their coexistence, and their comparative strengths and limitations? How can the future partnership could be improved to benefit the global community? 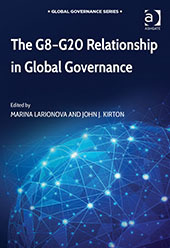 The contributors to this volume, edited by Marina Larionova and John Kirton, explain the recent evolution and performance of the G8 and G20 summits and their evolving empirical relationship. They consider the G8/G20 relationship with other actors engaged in global governance, notably the major multilateral organizations and civil society. They assess the summits’ effectiveness and accountability. And they identify, based on this empirical and analytical foundation, how the relationship can be improved for today’s tightly wired world. Contributors include Peter Hajnal, University of Toronto; Ella Kokotsis, G7 and G20 Research Groups; Dries Lesage, Ghent University; Zia Qureshi, World Bank; Martin Gilman, Mark Rakhmangulov, Andrei Sakharov, Andrey Shelepov and Vitaly Nagornov of the National Research University Higher School of Economics.